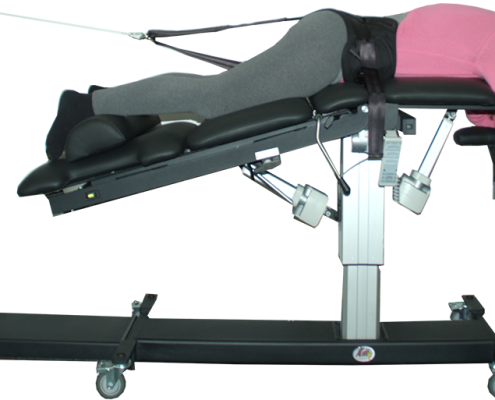 Pelvic Drop – New Option! 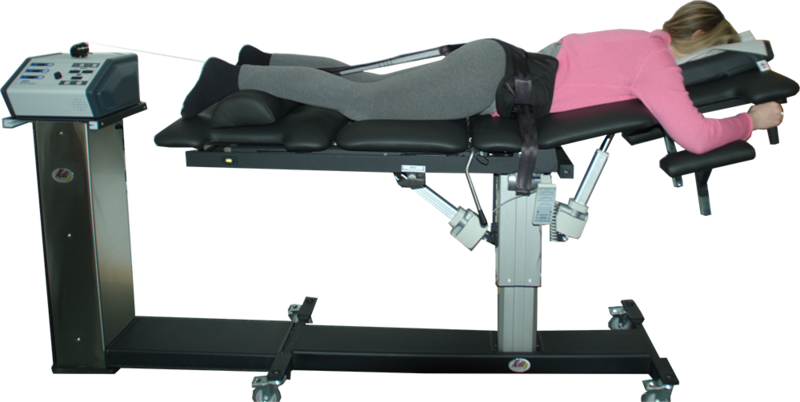 A New and Effective Pairing by Jay Kennedy, D.C., Backpain Solutions, Inc.
Over the years various attributes have been added to decompression systems, some for anatomical advantage others for comfort and convenience. 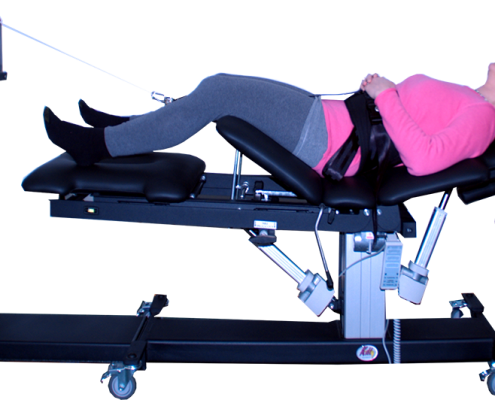 Either way decompression systems have become a staple in many Chiropractic clinics as well as innumerable hospitals and therapy centers. 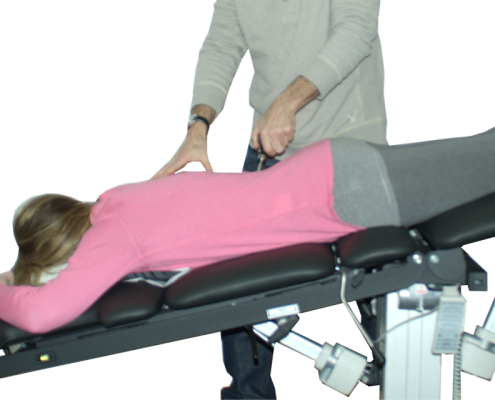 When patients have been pre-classified as having a compression-component to their back troubles decompression/traction therapy makes both intuitive and empirical sense. Anatomically, physiologically and clinically axial decompression works to de-stress compressed structures in the short-term. In the long-term it often triggers a physiologic improvement to disc healing. It appears decompression activates fluid and nutrient imbibition and may stimulate collagen fiber cross-binding reducing the strain on the outer, innervated annulus. Though this remains somewhat theoretical it is a very workable and understandable mechanism of action and one used in most public advertising and marketing information. So the basic action of decompression is both anatomical (recumbent posture and spinal distraction) and physiologic (nutrient exchange and cellular activity) we recognize there are still aspects to back conditions which may require other stimulus to promote optimum recovery and healing. Chiropractic has recognized this for a hundred years by utilizing high-intensity, low-amplitude thrust adjustments to the spine. 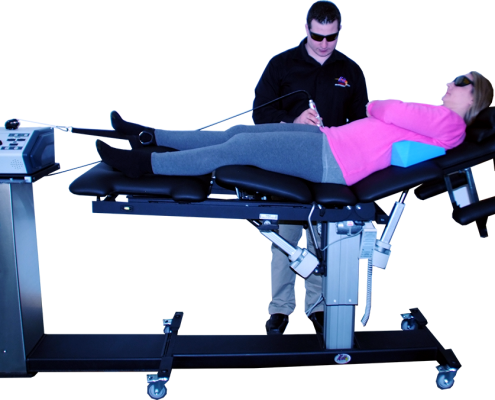 Manual P-A and rotational maneuvers were originally all that were available but as time and ingenuity progressed toggle adjustments, instrument adjustments and drop-table adjustments all took their place in Chiropractic. Though these are all different they all share the premise that a “thrust” accomplishes something a “stretch” may not or cannot. And assisted adjustment techniques are often safer, more comfortable and easier on the doctor than manipulation in some cases. 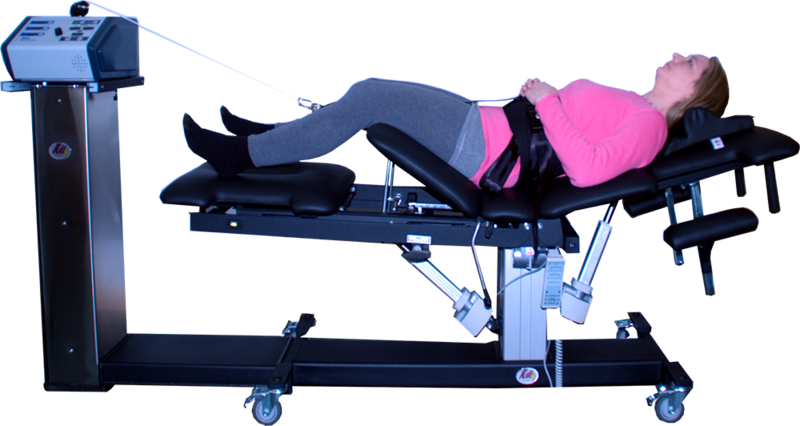 We have spent decades researching decompression, both as a patient classification phenomena but also from an equipment/table attribute viewpoint. 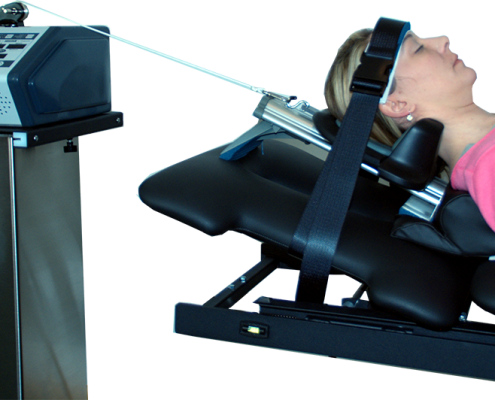 After months of clinical trials we recognized a new attribute to our decompression table could be extremely beneficial: a center-section drop-piece. This mid-section, pelvic support cushion aligns at its superior margin with the pelvic brim and with the ischial tuberosity at its lower margin. This makes for a perfect placement to add a drop section. The ideal drop is engineered to be of short-amplitude, very crisp and we believe vertical, not hinged at its’ inferior margin. 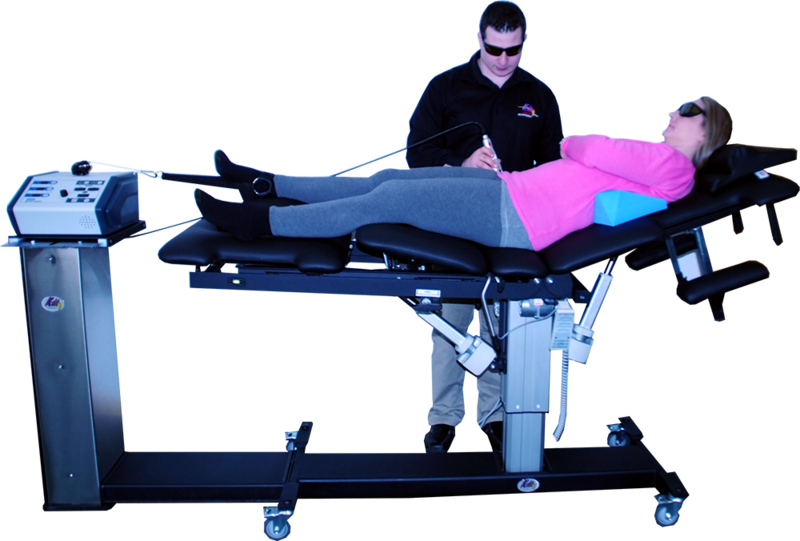 The vertical lift enhances joint-stimulation and comfort and it allows the patient to be placed in either direction on the table and still be adjusted effectively. 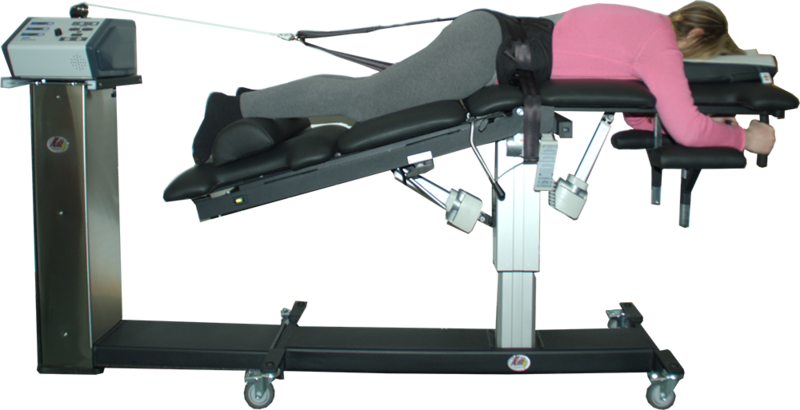 Over the past several years we’ve suggested “inversion-adjusting” as a treatment option for certain patients when using a table that allows a declination… most often patients are inverted/declined prone with manipulation and/or instrument adjustment or massage administered as needed. Modest inversion is typically well tolerated yet affords spinal-distraction and muscular quiescence to facilitate the adjustment and mechanoreceptor re-patterning. 1 We find that pelvic-drop adjusting while inverted has additional benefits as well. Frustratingly the validity and reliability of leg checks, relation to pelvic torsion (and corrective measures) are by no stretch scientifically finalized propositions. The traditional and well-worn interpretation that the PI is on the side of the short leg has also been brought into questioned through literature reviews. Cooperstein and Lew in the Journal of Chiropractic medicine (Sep 2009) conclude: “the innominate rotates anterior on the side of the shorter leg and posterior on the side of the longer leg…this finding is contrary to the common assertion the LLI is on the side of the posterior rotation”. However through awareness of these variables and through multiple examination findings a clearer picture of pelvic torsion/malalignment can and does present itself in many cases. Having an adjustment strategy for these cases is obviously an important aspect to patient care. There are obviously many practical applications for the use of a pelvic drop with more chronic decompression patients who demonstrate pelvic alignment and dysfunctional conditions (which may be the majority). However a drop-section adjustment can help trigger a postural re-alignment in some acute disc-block (non-neurological) presentations i.e. a patient “stuck” in flexion can be mirror-image(d) in extension and drop-adjusted to help rapidly restore extension posture. 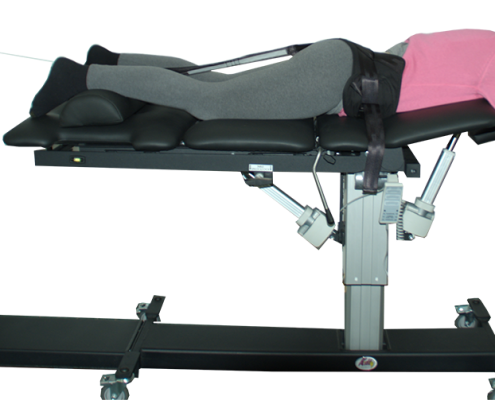 Utilizing a strain/counter-strain or muscle energy technique (MET) along with decompression and drop-adjusting can be productive in many conditions…all quickly done on one table. With the use of an open-modality belt a 10 minute decompression session can now become a decompression, Laser, drop-adjustment and manual-treatment encounter without impairing office flow or moving the patient off the table. Research consistently suggests SI joint conditions (perhaps fixation unilaterally) are causative in up to 15% of back conditions and perhaps as many as 70% of post-surgical fusion failures.6 Axial traction cannot “get at” the SI joint in any appreciable way however the combination of axial distraction (decompression) on the lumbar spine and the addition of a pelvic-drop may be very beneficial in many such conditions. There has been some reasonable consistency over the last decade as to the reliability of SI “diagnosis”.7 If (4) of the (5) SI joint provocative tests are negative there is a 70% chance against SI involvement. On the other hand (4) of (5) showing a positive finding give an odds ratio of 70% for SI involvement.7 Recently some studies have suggested of the 5 pertinent tests the iliac side-compression and thigh thrust have the greatest relevance.8 So the SI joints involvement directly or as an attendant feature can be deduced with a fair-to-good prevalence and if found may be partly addressed with a drop-piece adjustment after decompression has addressed the lumbar component. The relevance of addressing both components is an important clinical consideration since an absolute diagnosis of the contribution of each is unknowable until after treatment “proves” it (patient improves…however even then we are often still left to wonder). It’s estimated that over 70% of Chiropractors utilize a drop-piece on at least some of their patients. 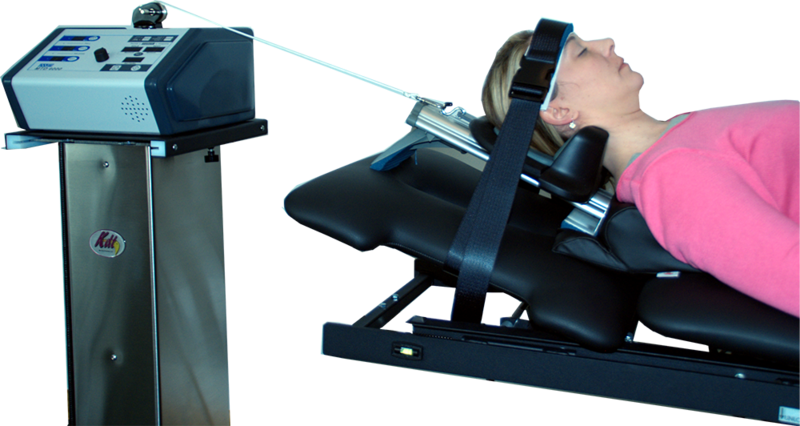 Having a decompression table with a drop-section affords many treatment and patient-flow benefits. 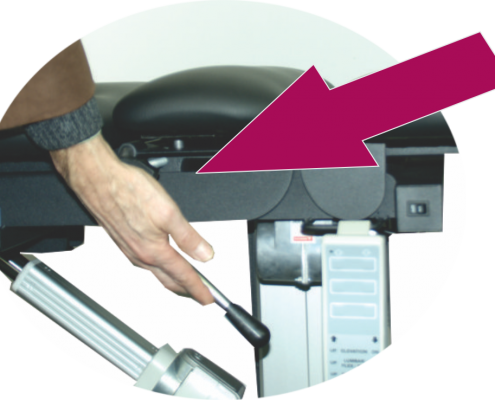 Most of us recognize many of our busy-time blockages are as a result of having to move patients back and forth between tables and rooms. If it appears a drop-piece adjustment would facilitate the patient post decompression moving the patient can now be eliminated in many cases. 1. Distraction of lumbar vertebra in gravitational traction. Tekeogula, I et al. Spine May 1998. 2. Derefield leg-check (referenced in Pierce technique manual 1985). Modern manual therapy. Grieves, G. Churchill Livingstone 6th ed. 1986 p. 765-767. 3. Malalignment Syndrome. Schamberger, W. Churchill Livingstone 2002. p.184-186. 4. Ibid. p.191 & the relationship between pelvic torsion and anatomical leg length inequality: a review of the literature. J Chiro Med. Sep. 2009. 5. Low Back Pain. Cox, J. Chapter 5: the sacroiliac joint. Lippincott, William & Wilkins 6th ed. 1998. p.229. 6. Degeneration of SI joints after instrumented lumbar or LS fusion (a perspective cohort study over 5 year follow-up). Kee-Young, H et al. Spine (33); 2008. 7. Biomechanics of back pain. Adams, Bogduk, Burton, Dolan. Churchill Livingstone 2nd ed. 2006. p145-147. 8. Diagnosis of SI joint pain: validity of individual provocative tests. Laslett, M et al. Man therapy Aug. 2003.